Macnas rounded off 16 days of festival performance on Sunday evening – but who carried away the awards? 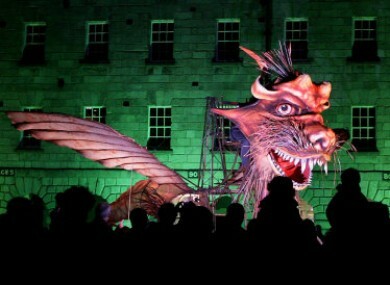 SIXTEEN DAYS, OVER 100 shows and a spectacular Macnas performance to finish it off (see slideshow below): that was the ABSOLUT Fringe 2011 in Dublin. Other nominees: Eternal Rising of the Sun; You Can’t Just Leave – There’s Always Something; Criminal Queers; Seekers. Other nominees: You Can’t Just Leave – There’s Always Something; Luca & the Sunshine; The Year of Magical Wanking; In My Bed. Other nominees: The Wheelchair On My Face: A look back at a myopic childhood; Luca & the Sunshine; The Yellow Wallpaper; Three Men Talking About Things They Kinda Know About. Other nominees: FOLLOW; The Adventures of Alvin Sputnik: Deep Sea Explorer; Man of Valour; Body Electric. Other nominees: Autobiographer; Jumping Off the Earth; Bird with boy; FOLLOW. Other nominees: In My Bed; Body Electric; You Can’t Just Leave – There’s Always Something. Tom Lane (Corokinesis: The 2nd Experimental Evensong & Music for Bird with boy). Email “And the winners are... ABSOLUT Fringe fest 2011 awards”. Feedback on “And the winners are... ABSOLUT Fringe fest 2011 awards”.